We welcome to the nursery groups wishing to discover our profession of rose growers. 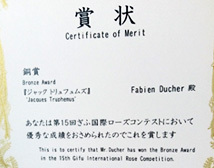 The rose 'Jacques Truphémus', wins a bronze medal at the international Gifu competition, in Japan, where it was appreciated for its scent. 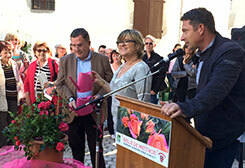 'Belle de Menthon ®' was dedicated in the presence of Mr Antoine de Menthon, Mayor of Menthon-Saint Bernard, Vice-President of the Grand Annecy, and of the association Jardins Animés, chaired by Laurence MICHEL. The dedication took place on May 20th, 2017. 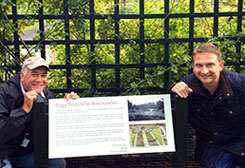 Dedication of the rose 'La Clé de la Rose ®' in the rose garden of Cluny, a rose garden dedicated to heritage roses. 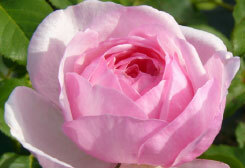 This rose, which flowers have a strong fragrance of heritage roses, can be planted in soil or grown in container. 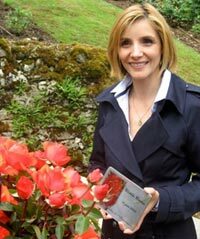 Dedication of the rose 'L'Art des Jardins ®', a rose eponymous to the renown French magazine dedicated to garden. Created in collaboration with Dominique Massad, the flowers have a pink color that is enhanced by the glossy medium green foliage. Its fragrance is powdery and cosmetics and the flowers can be used for bouquets. "Laurent Perrier des jardins" price rewarding family tradition and transmission of knowledge. 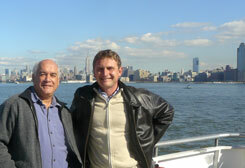 Visit at the Botanical Garden in New York with Stephen Scanniello, president of Heritage Rose Foundation. 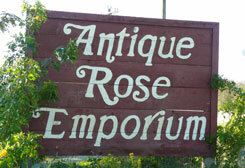 Roses Ducher will be planted there soon! 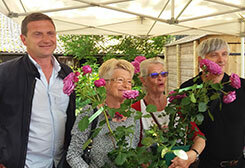 Dedication of the rose 'Benoite Groult ®' during the plant fair of Courson. The rose bush has very healthy dark green foliage. The flower, pale yellow with rose petal ends has a nice fruity fragrance. Reblooming is excellent. 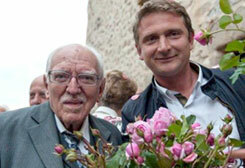 Dedication of the rose 'Jacques Truphemus ®', famous painter from Lyon whose paintings are known abroad. Flowers are old-fashion style with delicate pink color. They produce a pleasant fragrance. The plant blooms from May until frost. 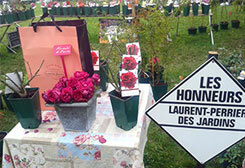 Dedication of the rose 'Stephane Bern ®' during the plant fair of Courson. This rose has very double flowers have a delicious odor of peach and mango. Flowering occurs continuously from May until frost. The leaves are bright green. 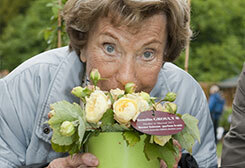 Dedication of the rose 'Josiane Pierre-Bissey ®' on June the 20th. 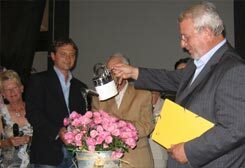 The dedication took place during the presentation of the first painted wall on the history of roses in Lyon during the 19th century. This project was supported by Roses Anciennes en France, an organisation for which Madame Josiane Pierre Bissey has been president. This fresco is in the 8th district of Lyon. Picture of Fabien Ducher with Josiane Pierre-Bissey during the dedication and of Fabien Ducher in fromt of part of the fresco devant une portion de la fresque devoited to the familly Pernet-Ducher and Ducher. 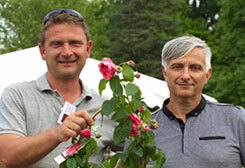 Conference at Lacroix Laval (69, France) to welcome the group Heritage Rose Foundation and visit of the nursery Fabien Ducher. 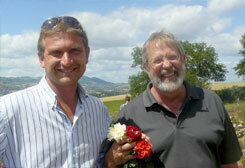 Picture of Fabien Ducher with Mike shoup (Emporium roses, Texas). Conference at the World Expo of Shanghaï (China). 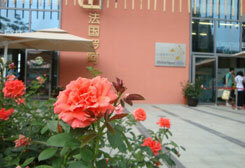 Picture by Pierrick EBERHARD: 'Soyeuse de Lyon' planted in Shanghaï. 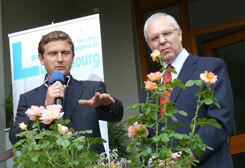 Dedication of the rose 'Jean de Luxembourg, roi de Bohême ®' at the Luxemburg embassy of Prague. Photo with Mister the Ambassador. Conference at the Antique Rose Emporium - Mike Shoup, Texas (USA). 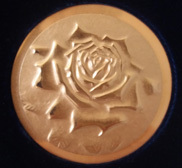 Conference for the Manhattan Rose Society in New York (USA). Picture with Stephen Scaniello, president of the Heritage Rose Society. 'Clotilde Courau ®', a new rose created by Fabien Ducher for the 10th anniversary of the Jardins de l'Imaginaire, was baptized on June 15th in the presence of the actress and princess of Savoy. This rose has orange flowers of perfect shape and a delicate fragrance. The shrub show good resistance to diseases. In agreement with Clotilde Courau, a donation bound to the sale of this rose will made to the association Dessine-moi un mouton. Clotilde Courau is the godmother of this association that helps pregnant women, children and teenagers affected by AIDS. 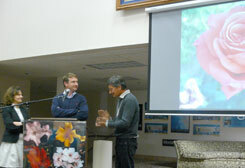 Conference at Hearst castle (California, USA) in presence of the famous American rose grower Gregg Lowery. 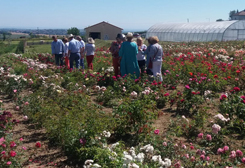 To celebrate Lyon as the capital of roses in the 19th century, the association Roses Anciennes en France and the district of Lyon 8 has organised an exhibition on rose grower from Lyon. 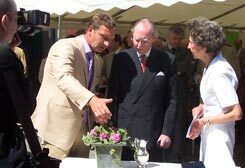 It is memory of these rose growers that the rose 'Rose de Monplaisir', one of our latest creation, was baptized during this exhibition. La rose 'Soyeuse de Lyon ®', création de Fabien Ducher, a été choisie parmi plusieurs autres roses proposées par des rosiéristes de la région Lyonnaise pour célébrer les 150 ans du Parc de la Tête d'Or. 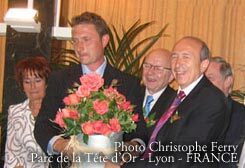 Le baptême a eu lieu le 1er June 2007 en présence de Monsieur Gérard Collomb, Sénateur Maire de Lyon, ainsi que de plusieurs adjoints. 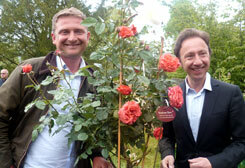 The rose 'Soyeuse de Lyon ®', a rose created by Fabien Ducher, has been selected among other roses proposed by local rose growers to celebrate the 150th anniversary of the "Parc de la Tête d'or (Lyon). The celebration took place on June the 1st in presence of Mr Gerard Collomb, deputy and mayor of Lyon, and many of the deputy mayor.